I wonder, too, about what the future holds for these people opting out of the culture in ever-increasing numbers. Some day the revolution will end, as it always does. The American people will elect a Republican president (Mitt Romney or some other centrist politician whose philosophies differ scarcely at all from those of Barack Obama). Rush Limbaugh will sell less mattresses and Levitra® on his radio show; Glenn Beck will attend prayer breakfasts at the White House; Sarah Palin will get a daytime TV talk show of her own, some second-tier gig on the CW or TruTV. But what about the true believers? Some people compare today’s right-wing extremists to the left-wing extremists of the ’60s. The Hutaree and the Black Panthers. Tea Partiers and hippie radicals. Michael Savage and Abbie Hoffman. But I don’t think the comparison is apt. There were older ’60s radicals, of course, but they were dilettantes, cocktail-partying with Bobby Seale, dabbling in the hippie scene for a few months before returning, safe and sound, to lives sheltered by money. Tom Wolfe and Hunter S. Thompson made a living, for a while, writing satirical essays about these people. They were never in any danger of being left out in the cold. The justice system they’re running afoul of isn’t the easygoing, permissive ’70s establishment, but rather the hyper-vigilant, increasingly merciless system of today. Jail sentences are longer, financial penalties are harsher. In terms of getting a job, it’s strictly one strike and you’re out. Try getting a second interview after checking the YES box next to Have you ever been convicted of a criminal offense? And by the way, the police these days are no picnic either, are they? I was surprised to discover during the Hutaree roundup that the Michigan police have tanks, actual battle tanks, at their disposal. They rolled into the town of Clayton like the Soviet army into Prague in 1968. The entire Michigan economy may be in the shitter, but the cops there are livin’ large. 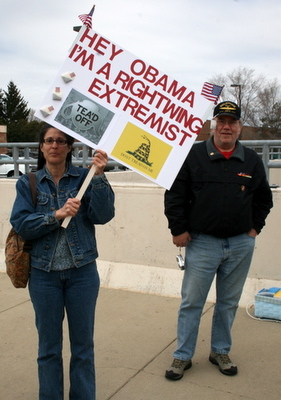 At any rate, whenever I see a bunch of Tea Partiers and militia members and Oath Keepers protesting the availability of healthcare for all US citizens or demanding the abolition of the Federal Reserve or insisting that President Obama produce a real US birth certificate, I feel a little sad. It would be one thing, I suppose, if all these “patriots” really were saving the Constitution from left-wing Bolsheviks or sparing us all from death panels and global warming research. But they’re really not. Instead, like Abbie Hoffman forty years ago, they’re insisting that we can cause the Pentagon to levitate in the air and turn orange if we think really hard. This is nothing more nor less than a polished-up, re-tooled version of Timothy Leary’s “Turn on, tune in, drop out” for a harder, harsher 21st century. I watch our modern new revolutionaries on TV, stocking up on ammunition and gold, and I see a bunch of middleaged people getting into the slow lane on the highway of life, putting their directional signals on, and taking a detour to nowhere. This entry was posted in Diatribes, Slanders and tagged Abbie Hoffman, Black Panthers, Glenn Beck, hippies, Hunter S. Thompson, Hutaree, John Birch Society, Michael Savage, militia movement, Oath Keepers, Ron Paul, Rush Limbaugh, Sarah Palin, Tea Party, Timothy Leary, Tom Wolfe by Harry Ramble. Bookmark the permalink. I love that they asked for “Public Defenders”, I guess they now know that there was an undercover FBI agent. The simpleton Tea baggers keep missing the point. These are the same whiners that were crying when the McCain/Bailin ticket lost. Now that their yelling (because they are haters not debaters) did not stop health care from passing, they are crying again. They think they can scare, intimidate and force others to go along with them by comments like “This time we came unarmed”, let me tell you something they are not the only ones that are armed and not all ex-military join the fringe militia crazies who don’t pay taxes and run around in the parks playing commando, the majority understand that the world is more complicated and grey then the black and white that these simpleton make it out to be and that my friend is the point. So it’s only fitting that their leaders are Sarah Bailin, Victoria Jackson, Michele Bachmann and their turn coat Glenn Beck. So if you are bothered that there are some misconceptions of your group, well then I think you need to be more careful who you invite to give you speeches. To summarize: (using your own words from this post) Like Abbie Hoffman forty years ago, they’re insisting that we can cause the Pentagon to levitate in the air and turn orange if we think really hard. Oh…wait…wait…I think I get it. Sharing resources is okay if you’re white, inbred, moonshine soaked morons who don’t want to pay taxes, but OTHERWISE it’s socialism….Is that it? The problem isn’t so much with the Tea Party but with the Republicans: the formerly conservative-to-moderate party is kowtowing to extremists. Thus, one of our two major parties is buying into fringe thinking.